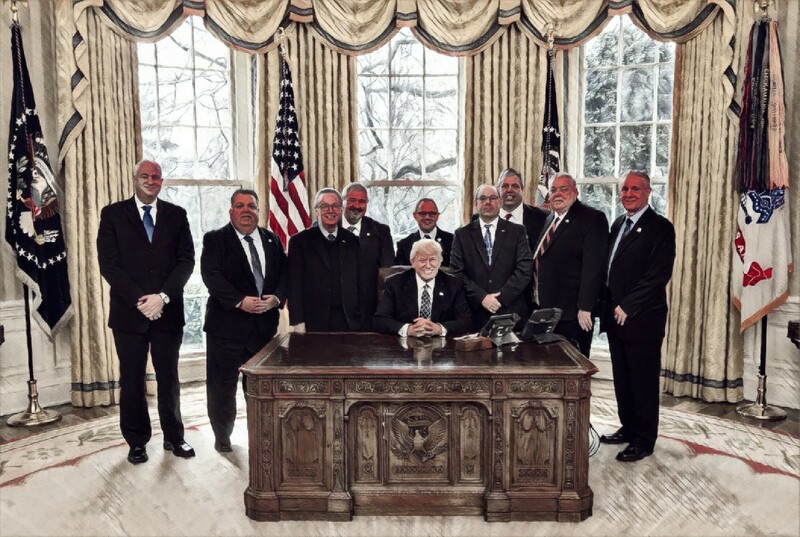 Image: Trump with leaders of the Fraternal Order of Police. From Wikimedia (edited). While a great deal of attention is being paid to Trump’s possible impeachment or removal and to his unvarnished bigotry and bombastic rhetoric, his government is transforming carceral policies at the state as well as the federal level. Whether it’s President Trump or President Pence in the White House, the changes are consequential, reverse the modest reforms of the Obama era, and will have a lasting impact. Despite Donald Trump’s mercurial temperament, he honed his ideas about criminal justice in the 1980s, long before he made law and order a centerpiece of his 2016 campaign. In The America We Deserve, ghostwritten in 2000, he cribbed from his “favorite crime expert,” James Q. Wilson of broken windows fame, and from the Heritage Foundation’s screed against indulgent judges and efforts to diversify police departments. As president, Trump made “Standing Up for Our Law Enforcement Community” one of his six political priorities, and he issued executive orders encouraging police to “perform the functions of immigration officers” while making “a chargeable criminal offense” grounds for deportation without a conviction. Trump successfully nominated a strict constructionist to the Supreme Court and a virulent reactionary for attorney general. The long-term threat to civil liberties, however, lies in his appointment of several extremists to lifelong positions as federal appellate judges. Trump’s nominees are mostly white men recommended by the Federalist Society, and they include candidates who are rated “not qualified” by the American Bar Association, support “conversion therapy” for gay youth, describe transgender children as part of Satan’s plan, and compare Roe v. Wade to the Dredd Scott decision. Jeff Sessions piled up such a monumental record of racist practices as the U.S. Attorney for the Southern District of Alabama, including characterizing the NAACP as “communist-inspired,” that even the Republican-controlled Senate in 1986 refused to confirm his appointment as a federal judge, despite Ronald Reagan’s endorsement. As Trump’s attorney general, Sessions has steered the Department of Justice away from modest efforts begun by his predecessor to reign in lethal violence and racist abuse by urban police departments. He opposes consent decrees on the grounds that they might “reduce morale of the police officers” and advocates the view that police malpractice is the doing of a few “bad apples” rather than a systemic problem. Sessions also reversed the Obama administration’s decision to decrease the federal government’s use of costly and abusive private prisons. In the first six months of 2017, arrests of undocumented immigrants increased by almost 38% over the previous year. Many families are now reluctant to report sexual assaults and domestic violence, to drop off their children at school, and to attend church. “People leave their loved ones in the emergency room and run away,” reported the chief executive of a New York hospital. If you’re worried about where President Trump is taking the country, worry as much about a President Pence. He rose to national prominence as a congressman (2002–2011) and then governor of Indiana who helped build the right-wing evangelical Christian base of the Republican Party by campaigning for restriction of birth control to married women and for criminalization of abortion. In Congress, he made a case for teaching “intelligent design” alongside evolution and became a leader of the far right caucus. As governor, he was an ardent advocate of the Religious Freedom Restoration Act that would have legalized discrimination by businesses against gays and lesbians. A leading proponent of unregulated capitalism, he has close ties to the Koch brothers, who have bankrolled his political career and envision him as presidential material. In return, Pence helped to bring into the Trump administration 16 high-ranking officials with ties to the Kochs. Beyond the carceral policies supported by Trump and Pence, many state governments are adopting more punitive policies and cracking down on dissent. Although the federal government shapes priorities and provides funding and other incentives, the majority of routine everyday policing and punishing is the responsibility of state and local governments. The decentralized nature of American punishment means that state-level changes are likely to leave lasting impacts on our everyday lives. State governments have adopted a range of policies that increase punishments for protest and civil disobedience, restrict access to abortions, and whittle away what is left of immigrant rights. Most legislation is concentrated in areas of the South and Midwest that were also Trump territory. Also, a coalition of conservative organizations, Right on Crime, has been effective at the state level in coopting a liberal reform agenda by advocating a reduced prison population as a cost-saving measure, increased financial restitution to victims of crime, and a higher level of proof against corporations charged with crime. A particularly important trend in state-level carceral politics is the wave of “back the badge” bills that increase penalties for assaulting cops, including petty assault enhancements that are likely to be used as tools to punish protestors. Encouraged by the Heritage Foundation and nationally known right-wing ideologues, including Reagan’s Attorney General Edwin Meese and former New York police chief Bernard Kerik, to go after Black Lives Matter groups, states such as Kentucky, Mississippi, Georgia, Arkansas, Utah, Nevada, North Dakota, South Dakota, and Kansas lead the way in “blue lives matter” legislation. Oklahoma, in response to the Dakota Access Pipeline protests, has significantly increased penalties for trespass or vandalism against refineries, pipelines, and oil/gas processing plants. These laws provide county and state prosecutors with additional tools to coerce protestors into accepting plea deals and to increase the punishment of those who unsuccessfully try to fight charges. The message of this swath of legislation is clear: Don’t organize, don’t protest, and don’t cause trouble. The state-level conservative crackdown has also included efforts to restrict reproductive rights, especially abortion: Arizona passed a law imposing new and burdensome restrictions on abortion providers, while Iowa and Kentucky have passed 20-week abortion bans. Missouri restricted the ability of people on Medicaid to have insurance payments for birth control and other reproductive health services. No matter what happens to Donald Trump or his administration, the slow, uneven progress that began in criminal justice reform under the Obama administration has already been significantly rolled back. Although the current regime represents a clear and present danger to democratic rights and legal safeguards, the consolidation of rightwing policies at the state as well as national level poses an enormous challenge to the progressive movement for the next decade. * Tony Platt, a founding member of Social Justice, is a Distinguished Affiliated Scholar, Center for the Study of Law & Society, UC Berkeley. He is completing a book, Beyond These Walls: A Genealogy of American Injustice, for St. Martin’s Press. Chase Burton is a doctoral candidate in the Jurisprudence and Social Policy Program at UC Berkeley. His dissertation research concerns the history of American criminology and its precedents in popular and literary discourse.